At Solar Entertainments we are very proud that a great deal of our work comes via recommendation from previous customers. Below are our latest customer reviews and testimonials. Older reviews can be found under the top menu Reviews link. Thank you to every one of our customers who have taken the time to comment on our services. We appreciate it greatly! A big thank you to Solar Entertainments for dealing with some very enthusiastic young karaoke singers! If you are looking for a party DJ, can highly recommend. 2nd year now we've had Dave and he always does a brilliant job. Excellent communication in advance, prompt set up and clear, friendly demonstration on the day. Great price as well. We'll definitely use Solar Entertainments again in future. I just wanted to thank you from all of us for a brilliant night to celebrate our birthdays. Your set up was really professional and it was great to have you there running it all. We're going to have another party in February so I'll definitely let you know. Thanks and best. Thankyou so much for a great evening, it was brilliant. The music went down a treat. You will definately get 5 stars from us. Just wanted to say a massive thank you from Rach and myself for last night. 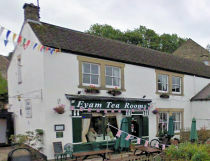 We will be recommending you to others and hopefully should you be available will book you again for our bash. Happy Christmas all the best for the NewYear and many thanks again. Thank you so much for Friday night! Everyone loved it! We will definitely look at using you for other staff events! Have a wonderful Christmas! 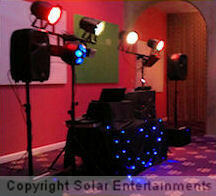 We would definitely recommend Solar Entertainment to anyone planning a party. The set up was great, Dave was friendly and nothing was too much trouble. Thanks again. Great service and great equipment. I cannot recommend Solar highly enough. I'd definitely use them again. Dave provided a first class service from initial communication, through to organising delivery of karaoke equipment and ensuring a smooth set-up, full and clear operating instructions and timely pick-up. Thanks so much for making this so very easy! 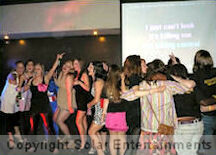 We wanted to say thank you to Solar Entertainments for doing a great job of the Karaoke on our Mamma Mia night. A great selection of Abba and 70-80s songs pitched at the perfect level. We will definitely book again! Really enjoyed having the team at a festival that we produced recently. The karaoke was loved by the crowd, and the team worked really hard to put on a fabulous show. Will definitely be inviting you back next year! Thanks so much! Dave was a really friendly, helpful and proactive person when I asked for some kit to self op in a venue he'd not been to before. He liaised directly with the venue and he handled the awkwardness of access for his equipment. I'd highly recommend him and definitely use Solar again. Dave did an amazing job for our wedding disco. We loved that you can choose some songs you want playing on the website and produce your own playlist - it really makes a difference when you know that you will enjoy the songs that will play. He also did a great job 'reading' the party and choosing some songs that would obviously go down a treat! If you book with him you will not be disappointed, we definitely weren't. Thank you! Hired karaoke equipment for a birthday party. Great service and equipment. Dave explained everything about the equipment so it was easy to operate. Would definitely recommend. We had Dave as our wedding DJ, loved that you could select your songs before, both what you like and hate. Great disco, had loads of comments on how well the music flowed. Thank you, highly recommend. Thanks to Dave for a fabulous children’s disco for my son’s 5th birthday. A friendly and professional service, going the extra mile to make things run smoothly. Would definitely recommend! Hired Solar Entertainments for my daughter's 18th birthday. Dave was so helpful and very quick to respond. I gave him the list of songs and programme of events and he did it according to plan. He is very organized and even made an effort to find a song from our local artist. I will definitely recommend him. Thank you so much Dave. This was my first time hiring a DJ and I was really impressed with the process from start to finish. Dave was always really prompt at getting back to me and the online invoicing system was great. I always felt completely reassured that everything was confirmed/reserved etc. The online request list is great for submitting requests prior to the party as well and there is also karaoke lists available beforehand. He emailed me the night before the party to confirm everything, turned up promptly on the day and did a fantastic job. My daughter loved her disco/karaoke party, thank you very much!